We are a member led organisation based on the principles of coproduction. Supporting the members are a small staff team and a board of trustees. Our broker supports members and organisations to exchange skills and get involved in timebanking. Alison is the development manager, who works with other organisations to raise the profile of the time bank as well as working on sustainability and fundraising. 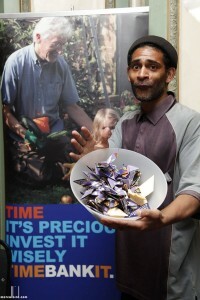 Dave is our Time4Lambeth project coordinator. He is responsible for helping to develop Timebanking in Lambeth! 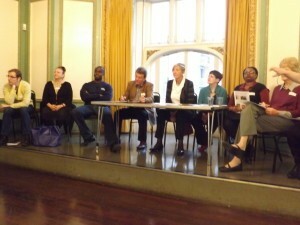 Funmi works on the Time4Lambeth project focusing specifically on Herne Hill. If you’re based in Herne Hill and want to Time Bank she’s your woman! Chair: Sue Gillie – Over 25 years’ experience in the non-profit sector as both a giver and as a board member. Co-founder of The Funding Network. Trustee and then Chair of the New Economics Foundation for 17 years. Sue lives in Southwark. Vice Chair: Dr Tyrrell Evans is a retired GP from Paxton Green Group Practice, with considerable experience in the organisation and delivery of health care in South East London. Joint Vice Chairman of Christopher’s Hospice. Tyrrell lives in Southwark. HON. Treasurer: Christine Warren, retired NHS Pathology manager with experience of finance and staff management. Chrisitne lives in the borough of Croydon. Joseph Boateng – Facilities manager of Kingswood House, Chair of Kingswood Estate Tenants and Residents’ Association and the Kingswood Network. Joseph is a resident of the Kingswood Estate, in Southwark. Jenny Park: retired social worker. Long term Southwark resident with experience of various community groups as a member, a volunteer and a trustee, including a period as a school governor. Carol Denneth Lath is a retired CIPD qualified HR practitioner whose specialist interest was employment law and senoir level recruitment. She has worked for major multinationals in UK and abroad, and speaks French well. Carol lives in Southwark. Deepak Singh: solicitor-advocate, retired 2015 from working from the Crown Prosecution Service. Deepak lives in Lambeth. Kim Brown: a corporate middle manager in Retail, passionate about Leadership and Coaching. Kim lives in Greenwich and is very active in her local church including being on the PCC. In February 2008, Drs Kevin Brinkhurst and Gemma Anson, General Practitioners based at Paxton Green Group Practice considered a proposal to Lambeth Primary Care Trust for a Time Bank in this area. The inspiration was Rushey Green Time Bank, Catford, and after a lot of research and visiting other South London Time Banks, a bid for a Special Fund established by Lambeth PCT was submitted. The practice was delighted when the PCT agreed to fund a Time Bank for 2 years. Two interim staff were employed to generate local interest in timebanking, and to recruit a board of trustees. The current staff team came into post in september 2008 and were working out of the Practice before moving into our new offices in Kingswood House in November 2008. PGTB currently has around 300 active members, a figure which is growing weekly. We take referals from the staff team at the Practice, and are also open to the whole community. People self refer, and come to the timebank through word of mouth and through meeting us at local events or coming also to our drop in which is every monday at the Practice. We also work with a broad range of organisational members and their communities.